Way back in 2012, one developer proposed what was then a radical idea: tearing down what had been a cheesy restaurant and a moat of parking overlooking a faded corner, and replacing them with a gleaming tower housing 99 apartments, two shops, and just 16 car parking spaces. Ever since 1611 W. Division Street showed the way — both from a legal and a market standpoint, developers have flocked to the adjacent blocks of Wicker Park to try and replicate its success. Last year, the original ordinance permitting 1611 W. Division to be built with so few parking spaces was expanded to encompass a broader array of sites in the city. Many of the newly permitted sites for these transit-oriented developments happen to encircle the Chicago Transit Authority’s station at Division and Milwaukee, an intersection better known as the Polish Triangle. This largely built-out area, adjacent to thriving retail corridors along both streets, has many small pieces of land where redevelopment had been hindered by city zoning that required many on-site parking spaces. Now, thanks to new rules, new apartments can be built without expensive and sidewalk-interrupting parking garages. Out of 15 developments citywide proposed under the TOD rules so far, six – including 1611 W. Division – are in Wicker Park. Read more about five new developments below. The Wicker Park Lofts will occupy a sliver of a space where Haddon bends between Milwaukee Avenue and Ashland Avenue in Noble Square, just under 600 feet from the CTA’s Division Blue Line station. This building will have 40-unit mix from studios to three bedroom apartments, with just 21 parking spaces. Developer Wicker Park Apartments, which owns and operates all of its buildings, said on the project’s website that this is the first project to be approved by the Chicago Plan Commission under the TOD ordinance. Building permits were received two weeks ago, so construction could begin once two buildings on the site are demolished. Centrum Partners, which is also developing a TOD residence at 3400 N Lincoln, has proposed a six-story building with 60 units and 24 parking spaces, less than a block west of the Division Blue Line station. Centrum will also provide six affordable units on-site, instead of “cashing out” and building affordable housing elsewhere. Alderman Proco “Joe” Moreno has said he prefers affordable units be provided on-site, to serve the needs of lower income residents within developing communities. Lipe Property Company recently showed plans to the Wicker Park Committee to preserve an existing building in Wicker Park, create a rear addition above the building, and construct a four-story residence in an adjacent vacant lot. The whole development would have 13 residences and seven parking spaces. The existing 114-year-old building has four apartments and was noted in the Chicago historic resources survey for architectural significance. Even though the property is 950 feet away from the Division Street Blue Line station, Division is a designated Pedestrian Street so the TOD ordinance applies up to 1,200 feet away rather than the usual 600 feet. 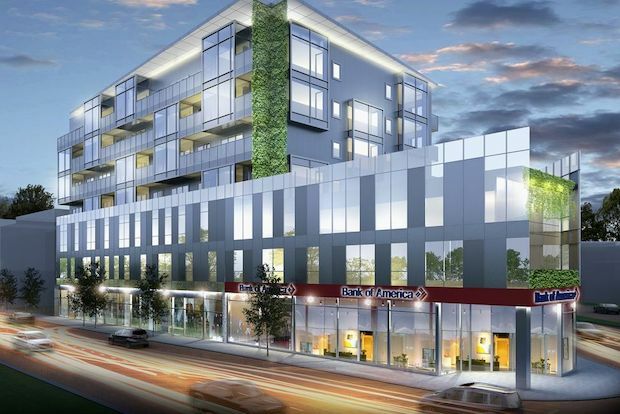 This proposal from LG Development Group, which has proposed two TODs in the area, is part of a larger project involving several adjacent plots that now includes a car wash just north of the busy Milwaukee, North, and Damen intersection. The new building at this address would have 36 apartments (from studios to two bedroom units) and 11 parking spaces. LG is already advertising luxury condos for sale at the site. LG Development Group started construction on this 58-unit, seven-story building in Wicker Park last month by demolishing multiple buildings near the Bank of America, at the north corner of Ashland Avenue and Milwaukee Avenue. Surprisingly, the replacement structure will have zero car parking spaces – large, rectangular parking spaces are particularly difficult to arrange on narrow triangular lots like this one. This appears to be the first project to start construction under the 2013 ordinance. It should be completed in spring 2016. This makes me very happy. The only thing that could make it better is if the rendering of 1237 N. Milwaukee had some cyclists in it. When the 1611 W Division building was proposed Alderman Moreno committed to the community that he would decline any request for residential permit parking from a resident of the building. It’s apparently written into the leases so tenants are well-informed that they will not receive a residential parking permit. Instead there are cars with blurred light lines which usually indicate speedy travel. The drawing of the surroundings is so wholly inaccurate that it makes me wonder if the rendering of the building is accurate. :-) It will be a nice addition to the area, in any event. Since the car-lite community winner is Wicker Park, Milwaukee Ave should immediately be upgraded with a solid bikepath straight to Kinzie!